Here at Alliance Tire Group we can tell you all day long about our commitment to delivering quality - but it’s especially satisfying to us when one of our customers shares their great experiences with our products. Steve Jensen and his team at Farmers Cooperative in Firth, Nebraska, have been putting Galaxy Muddy Buddy tires through their paces and keeping track of the results on a whiteboard over the last five years. The terrain in downtown Firth is almost like an obstacle course for skid steers, which encounter a huge variety of tire-defeating terrains and conditions in their daily routine. Whether it's on the asphalt and brushed concrete of their receiving area, on the road, over railroad tracks, through a dirt and gravel yard (which, when dry, can resemble a boulder field and is a slick, muddy mess when wet), the Muddy Buddys have stood up to the challenge. Because ATG knows no work site is perfect, the Galaxy Muddy Buddy has been engineered to handle challenging conditions like the ones encountered at Farmers Cooperative. While the extra-deep lugs, shallow lug angle, and sharp shoulders make it perfect for working in the slop, the Muddy Buddy’s high rubber-to-void ratio and special rubber compound deliver excellent performance and long life when working on hard, abrasive surfaces. Jensen and his team learned something ATG knew all along: the Galaxy Muddy Buddy and our entire line-up of Galaxy skid-steer tires are true all-around performers. 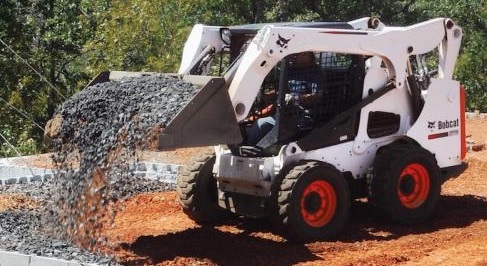 According to Jensen, the Galaxy Muddy Buddy far exceeded his expectations in terms of its handling of the terrain, becoming the new go-to skid-steer tire for the fleet and - he believes - saving them on total costs over the lifetime of the tire. Read the full article on Steve Jensen, his team at Farmers Cooperative in the December 2015 issue of Modern Contractor Solutions.